The Japanese art form of kintsugi uses gold to strengthen and rebuild shattered ceramics. 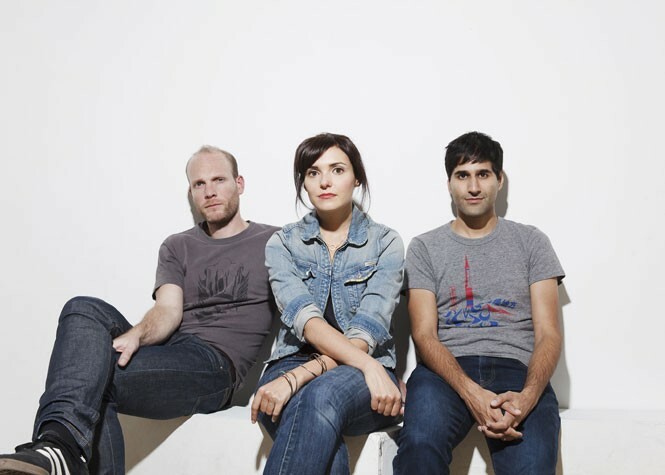 For Nils Edenloff, the lead singer and songwriter for the Alberta, Canada-based rock band The Rural Alberta Advantage, this was the perfect image to describe the feelings and themes presented on the band's new album, Mended With Gold, released in September. "I went through a breakup last year, so a lot of the songs deal with the ending of relationships, the finality of certain aspects of life, and the idea that better things come from those losses," Edenloff says. "That's sort of what the album title alludes to, the idea that something is rendered more beautiful by its having been broken, and is better for the history it's been through." A number of the album's tracks do indeed focus on the fragile nature of our lives and relationships. Apart from its self-explanatory title, a song like "On the Rocks," for example, is given extra power with a thrumming bass line that hints at discord, while drummer Paul Banwatt's repeated up-tempo work on his hi-hat gives the impression that the song—much like the relationship mentioned in the song—is about to explode. The dance-rock track "All We've Ever Known" examines those hard moments that immediately follow a life-altering event that shakes us to our core, while the opening and closing tracks—"Our Love..." and "...On the Run"—bookend the album in a clever way, suggesting that relationships involve struggles that can, like these titles, separate people. And while the record is a confident mix of indie rock and folk pop that shows off the trio's considerable songwriting, as well as their instrumental and vocal talents, Edenloff had to separate himself from life as he knew it just to get the ball rolling on this project. "Early on, I was having trouble focusing," he says. "I talked to some friends who had rented a cottage up in northern Ontario, and they highly recommended it, so I went up there by myself. I didn't realize how scary a place it was until I was there all on my own, out in the middle of nowhere." Staying in a dark, secluded cabin by himself did a number on Edenloff's nerves, but it was the jolt he needed to start getting to work on the record. "It was definitely surreal, a little nerve-racking," Edenloff says with a laugh. "I won't lie, I had my Leatherman knife at hand's reach. There's nobody around for miles, it's a creaky old house ... it was odd, but great. Not a lot of the album's songs came from that experience, but some did," including "To Be Scared," he says. "To Be Scared" is one of the album's mellowest songs, trading in the driving guitars, rip-roaring drums and unbridled energy that courses through the veins of the majority of the album for a folksy sensibility and more restrained vocal performance from Edenloff. When paired with lines about there being no reason to be scared, especially with respect to moving on from tragedy, the overall effect is one of a person revealing their cracks to the world for the first time and gaining courage and strength from that, rather than being embarrassed by it. This title and song are emblematic of another struggle that plagued Edenloff prior to the making of this album. "I was apprehensive because I never felt like we were ready, and that the record wasn't ready, sonically," he says. Now that Mended With Gold is here, he credits Banwatt, sound engineer Matt Lederman and multi-instrumentalist Amy Cole for "being like, 'You know, I think Nils doesn't realize how much stuff we have here and how ready we are.'"